Charming 1200 square feet property, sleeps 6, furnished and clean. First floor has open-floor plan with fully-equipped eat-in kitchen, washer and dryer, living area with HD Smart TV, DVD and Roku, and half bathroom. Upstairs are 2 bedrooms with a full bathroom. One bedroom has a queen bed with Twin stack bunk beds and there is a queen bed in the other bedroom. Large outside deck with plenty of seating for entertaining and grilling. I love my beach, its Chic's Beach and its locals. You can go to the Oceanfront, Williamsburg, Norfolk or down Shore Drive, but come back to a relaxing place; your own spot . Great deck to sit out at night. The sunsets over the Chesapeake Bay are fabulous and you can walk for miles or surf fish for relaxation. Cornered by 4 restaurant/bars a block in each direction and a Mini-mart 1 block away; I think we have it all. Kayaks and Paddleboarders would truly welcome the ramps at 250 ft. HK by the Bay, will deliver you food right on the beach............how fab is that! Launches for jet skis and small boats are a mere 2 miles away. 1 hr North is Williamsburg and 1 1/2 hour South is Kitty Hawk, NC, and Hatteras is 3 Hours if you can't find enough fun here. Parties of 10 or more are never permitted and will cause the rental to be terminated immediately and the deposit forfeited. Wonderful home....very comfortable and welcoming. I stayed at this property during Hurricane Florence and so glad it didn’t get cancel due to the storm. Unfortunately, I couldn’t enjoy the beach like I wanted too due the weather. The home is clean and spacious. The beach is only one block away and there are restaurants nearby. If i ever go back to Virginia Beach I will definitely stay again! Nice neighborhood and lots of friendly people. Thanks for sharing your home Eileen and nice meeting you! The house is in a great location and only 1 block from the beach. It is fully stocked with everything you need including pots and pans, condiments, beach chairs, towels, cleaning supplies, etc. The owner was very responsive and checked to make sure everything was going well. Walking distance to variety of good restaurants. Would definitely recommend staying here! Beautiful ocean house. Really less than 1 block around corner to sandy beach. Our kids loved it. Comfortable. We had a fantastic family vacation at Eileens cottage. The location was perfect for our small children (1 and 5). The house has everything you need and more. Eileen was a wonderful host, very attentive and responsive to my many emails and texts. The kitchen was fully stocked with everything you could need and so are the two upstairs bedrooms. 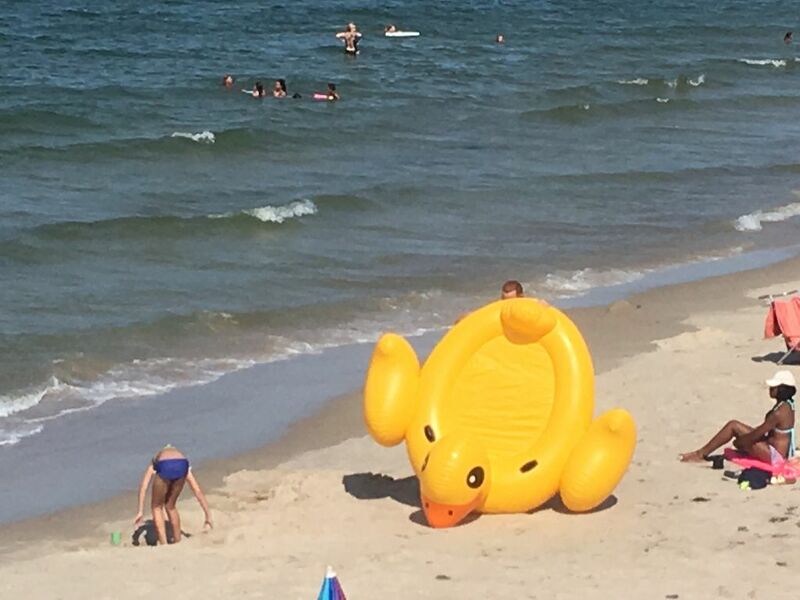 Chix Beach is the perfect beach for families with small children-safe and quiet with calm waves and not all the hustle you'll find in Virginia Beach. Thank you Eileen for such a wonderful stay. We will definitely be back! The whole family absolutely loved this place! The house is so charming and the location is perfect. There is nothing this place is lacking and we were planning our return trip from the minute we arrived. Located 1 block from the beaches of Chesapeake Bay and centered between 4 local restaurants. Fifteen minute drive to the Oceanfront boardwalk to the east. Fifteen minute drive to the zoo and downtown Norfolk attractions to the west. Colonial Williamsburg and the Outer Banks of North Carolina are an easy day trip from this location.